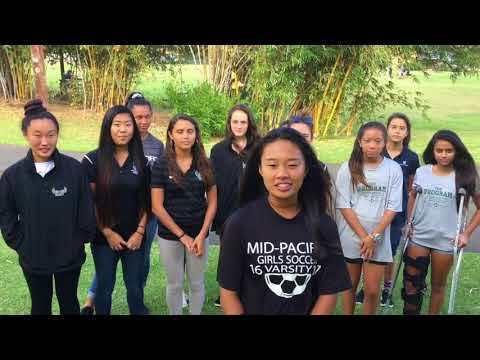 This year, the ladies of the 2017 Mid Pacific Girl's Soccer team have an amazing opportunity to participate in an ECOS community service project. Through ECOS, a 501(c)(3) non-profit organization, they will support the City and County by completing a work day at Liliuokalani Botanical Garden in down town Honolulu. This project provides these student-athletes a chance to exercise individual responsibility and stewardship of our environment, learn about Hawaiiana and the significance of this cherished park, understand their roles to become productive citizens, and earn through honest efforts. We humbly ask for your pledge donations that will help them accomplish a successful ECOS community service project and also support their soccer program needs for the 2017/18 season. To support, please click on the DONATE NOW button and you will be guided through the simple and secure process. Please note who you are supporting in the comment section. And be sure to visit ECOS' Facebook page (Keyword: ECOSproject) after the event to see pictures and descriptions of the great works competed!